In this ebook cover complete IT theory with some previous year asked questions topic for IBPS RRB Scale-2,IBPS IT ,SBI IT, Insurance Specialist and other exams.You need not to buy any other book for IT Officer exam.Read this book completely before an exam.To understand the concepts of these topics ,watch our YouTube Videos and Subscribe our Channel for further updates and join our Facebook Group For MCQ. i am already mention this is complete theory it ebook…….shitanshu firstly you read this all theory…..lot of questions will ask from this theory…..i will soon start to post MCQ on our Facebook Group……Don’t be disappointed……..Read this theory completely….. Unable to download the ebook.If possible please mail:mehrotra.neetesh@gmail.com. I will be very grateful to you. Paper 1 and paper 2 ka exam 1 hi din hoga kya..? I purchased the book but no link there after that to download, pls send it to me on vibhu.nadaun@gmail.com, if require i have payment reference number. Have you received the pdf, how is the content quality? Sir can we fill NTRO scientific assistant Computer Science exam .In NTRO Recruitment written that only apply BSC n Diploma Students same as to meteorological recruitment. Plz tell me BE/B.Tech students can apply or not? Unable to download the ebook.If possible please mail:anjus345@gmail.com. I will be very grateful to you. i have done payment still i didn’t get pdf. Hlou vinay…have you received this pdf? Thinking to buy this pdf. Sir I make the payment but still not get the pdf….pls help me. Thanks..Can u plz tell me how`s the content? Plz hme vi share kr dijiye book… Prso hi exam h.. Anyone got the PDF of NIC?? Have u got now ? my financial situation is not well..but i want to study.so please if someone help me ,it will be a great help. .
hi Neeraj,i have made the payment yet did not get the pdf for Professional Knowledge Complete Theory IT Ebook For IBPS RRB SCALE-2|SBI IT|IBPS IT|INSURANCE SPECIALIST EXAM 2017-18.
could you plz do me a favour and mail it to my id. Finally got the pdf…..thank you so much sir. my financial situation is not well.but i want to study.so please if someone help me ,it will be a great help. hello nil i tried to buy the book can you sell it to me i will pay you , just give me your paytm number and please send me the pdf on my mail siddharthrd2014@gmail.com. hello sir already paid the amount. Can you send me the link at rabharituparna@gmail.com . Hello sir, I am unable to download the pdf already done the payment. Could you please mail it to me at lipi_vithika@rediffmail.com. I just purchased the ebook but I didn’t get any link to download, plz send it to me on ritwikdev95@gmail.com. Or if someone else got the ebook please kindly send it to my email id, that would be very helpful for me..
Sir, I tried to purchase the studyregular IT Officer Ebook(1000) questions but the money(cost: 55) was deducted till didn’t get the Ebook. Please kindly would you send the Ebook to my mail id? That would be very helpful. Sir I paid the amount but didn’t get ebook.please send it to my email. Unable to download the ebook.If possible please mail:pandyakrishna20@yahoo.com. I will be very grateful to you. my financial situation is not well.but i want to study.so please if someone help me ,it will be a great help. .
hello brother , seems no one is listening over here can u help me in getting the book. i have made the payment yet didn’t get any pdf,plz send it to my id asap. i have made successful payment of Rs110 for ebook of scintific assistant . my transaction Ref no. IGACHHIXL3.but i was unable to download the book. my payment id MOJO702000A92476176 but i was unable to download the book. can you give me any paytm number so that i can pay you and then please send me the pdf on my gmail (siddharthrd2014@gmail.com) as i am observing that almost everyone is facing the problem in downloading the pdf. 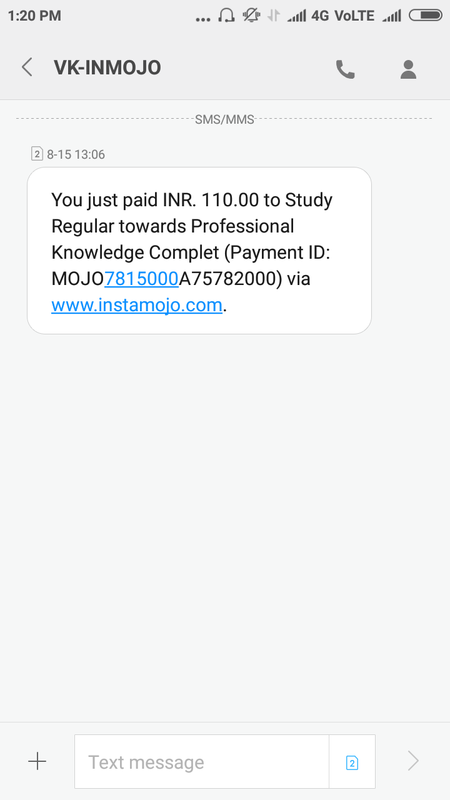 sir i have paid an amount of 110 rs via instamojo with payment id MOJO7B20000A75322414 FOR PURCHASING THE BOOK OF SO IT OFFICER . I have paid the amount but still I did not get book and my exam is very near so plz send me the book on kumar.4760@gmail.com,plz take it on high priority.